Title: BEACONING Presentations on Game Based Learning are Online Now. 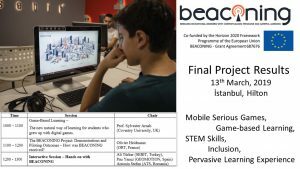 During the Istanbul exclusive BEACONING event, there were three sessions during which game-based learning and the BEACONING solution was presented. Now, these key presentations are available online for the 300,000 teachers in Turkey, who are active users of the Vitamin CPD portal.